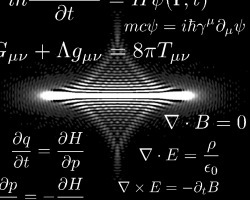 Researchers in this group explore a variety of problems in the field of contemporary theoretical and computational physics. Topics range from studies of fundamental laws of physics to problems with a more applied flavour, all of which can be tailored to suit the candidate's own research interests. Research areas represented include quantum mechanics and field theory, quantum information theory, theoretical astrophysics, phase transitions, ultra cold atomic gases and theoretical optics. Many of the research projects offered to students have a strong emphasis on computational methods and numerical calculations. High-performance and supercomputing facilities are accessible via the Monash eResearch Centre. Numerically evaluated spatial intensity distribution of light illustrating aspects of wave-particle duality. Image is decorated by Schrödinger's, Dirac's, Einstein's, Hamilton's and Maxwell's equations.